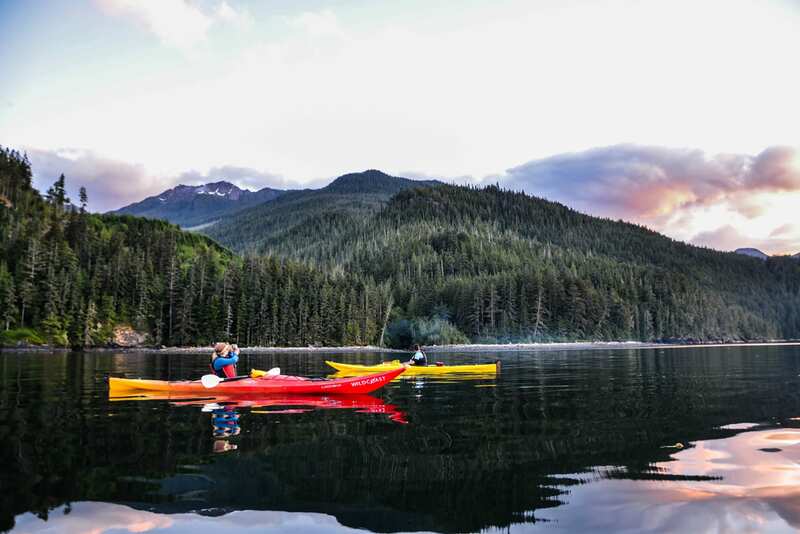 Imagine escaping to the heart of British Columbia’s west coast and heading into the wilderness on a Kayaking & Glamping Adventure. This Whales & Bears Kayaking Adventure is an unparalleled, transformative outdoor experience not to be missed. Your trip starts out at a quaint coastal hotel, your launch point for your first expedition into the wilderness seeking out wildlife. Keeping up the pace, on the third day you will board a water taxi to spend four days glamping in the deep wilderness where you will go kayaking in killer whale territory. 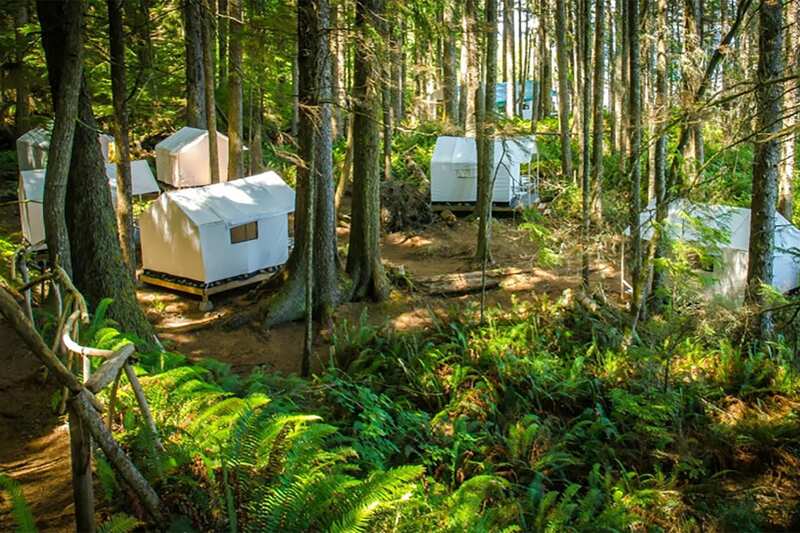 Whales, Bears, Glamping – this trip has it all. Today you arrive in the picturesque town of Campbell River. You will be able to check into your hotel at 3:00 pm today. If you have time before check in, enjoy a waterfront stroll, or experience Elk Falls for a hike. After enjoying breakfast at your hotel, we get our first taste of the pristine wilderness of BC, enjoying a wildlife tour by motorized boat. If your trip begins in June through August, there will be a half day tour on a zodiac, or covered boat. For September departures, there will be a full day Grizzly Bear wildlife tour. Today we set off for our wilderness camp! This thrilling ride by boat to our camp includes passing through the Discovery Passage, and the infamous Seymour Narrows. As we take in the pristine beauty of this unspoiled coastline, it is not uncommon to spot whales, dolphin and porpoises! As we arrive in camp, we are greeted by the camp staff, and shown to our wilderness accommodations. After we settle in, the afternoon will be a great time to get familiar with our kayak equipment, getting prepared for our first paddle of the trip. Today we will experience our first full day on the water. As we paddle and take in the serenity and natural beauty of this incredible coastline, your expert guide will educate you on the intricacies of this natural wonderland. There is much to see and learn, including the ongoing threats to wildlife, and resurgence of species in the area. Not only is being on the water spectacular, but you will also venture inland to a beautiful waterfall, where the brave can submerge in the glacial waters! 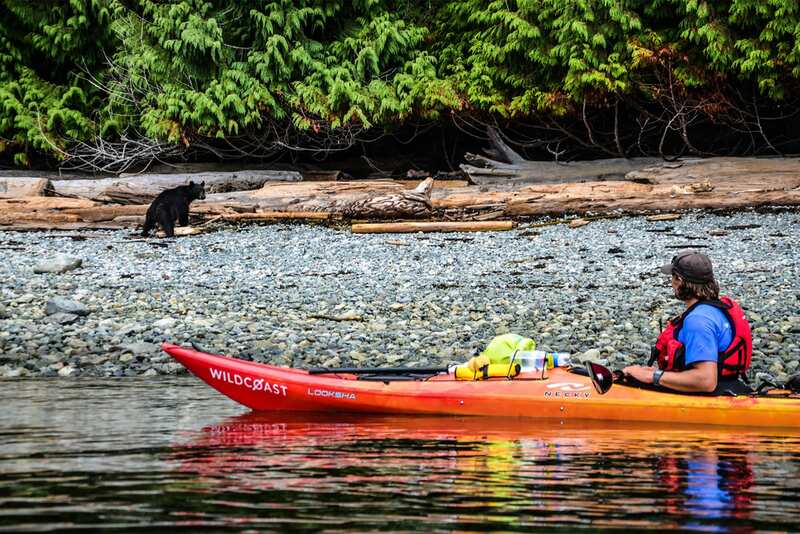 Today we paddle across the Johnstone Strait, paddling close to the shoreline while we keep our eyes open for foraging bears and their cubs that frequent the area. We will make our way to the island directly across from our camp, returning from the challenging paddle in the afternoon. This afternoon and evening, you will have the opportunity to take in the sights and sounds of this remote coast while you relax in the native sauna and hot tub. After we wake up in our tents one last time, we will have our last chance for a sunrise paddle. Soak up the final moments of your wilderness experience while hanging out on the beach, and taking in the serenity of this pristine landscape. You will arrive back at your hotel in the afternoon today. Enjoy a deserved lazy morning in the comfort of your hotel today. Today will be our final day on this adventure, and check out time will be 11:00 am. A safe journey home in the morning or afternoon, or ask us about other adventures in the BC! Upon your arrival, you will be checked in to the Campbell River’s newest hotel for adventurers. Nestled just steps away from the waterfront this is an ideal location to begin your Whales & Bears Kayaking Adventure. Arrival time on your first day is up to you. Whether you choose to meander your way up to the island from Vancouver or Victoria or arrive early to fit in an additional adventure, there is no wrong way to plan your day. You will spend both your first two nights and your final night at the coastal hotel. Immersing you into the wilderness quickly, a wildlife tour is planned for your second day. On your third day you will head to Orca Camp. Boarding a water taxi at nearby Fisherman’s Wharf you will take an exhilarating boat ride deep into the wilderness up to camp. 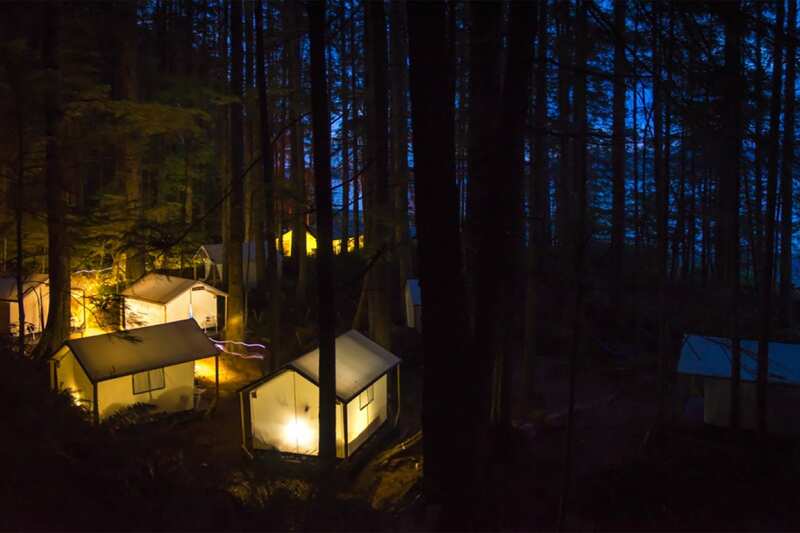 Orca Camp is situated directly beside the Robson Bight Ecological Reserve in Johnstone Strait, and located next to a flowing stream, under a canopy of ancient cedars in the British Columbia rainforest. This is where whales spend their days throughout the summer. During this part of your Whales & Bears Kayaking Adventure you will kayak, sleep in safari tents, enjoy campfires and eat delicious food. In addition, you will have the opportunity to participate in wilderness activities such as soaking in a wood-fired hot tub, relaxing in a native style sauna, and (for the brave) plunging into the mountain-fed glacial stream. Your Whales & Bears Kayaking Adventure begins with a covered boat tour with the region’s top rated operator. June through August is prime time to explore the Discovery Passage and surrounding islands. Home to some of the world’s most spectacular wildlife. 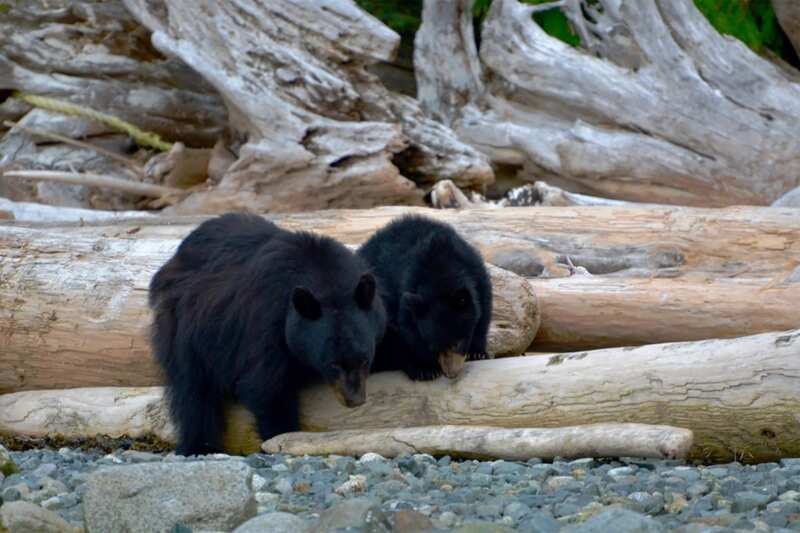 Your guide will seek out Dalls Porpoise, Pacific White Sided Dolphins, Sea Lions, Eagles and Black Bears. September is Grizzy Bear Season! Trips during this time travel aboard a high-speed covered boat into the Orford River Valley. Once you arrive the Holmalco First Nation will invite you onto their traditional territory. Climbing up onto their bear viewing platforms you will have an unobstructed view of Grizzly Bears as they roam the river banks and feed on the spawning salmon. Then, it’s onto finding Whales. Departing early in the morning on your third day, you will meet the water taxi at Fisherman’s Wharf to take you north to Orca Camp in Johnstone Strait. 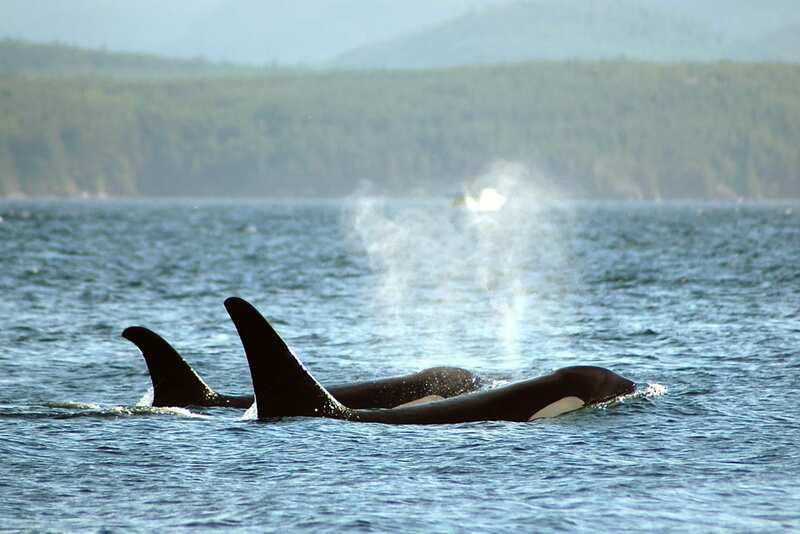 Camp is ideally located next to the Michael Biggs Robson Bight Ecological Reserve, home to the Orca Rubbing Beaches. 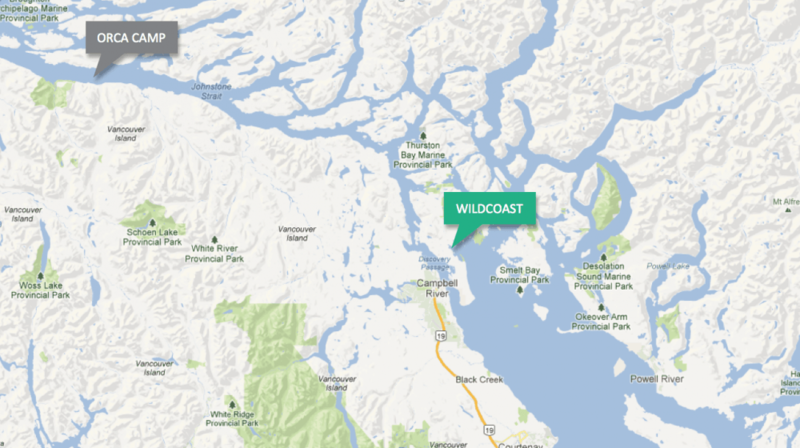 It’s an excellent launch point to go kayaking in killer whale territory. Over 500 Orca (Killer Whales) travel through this part of the coast. 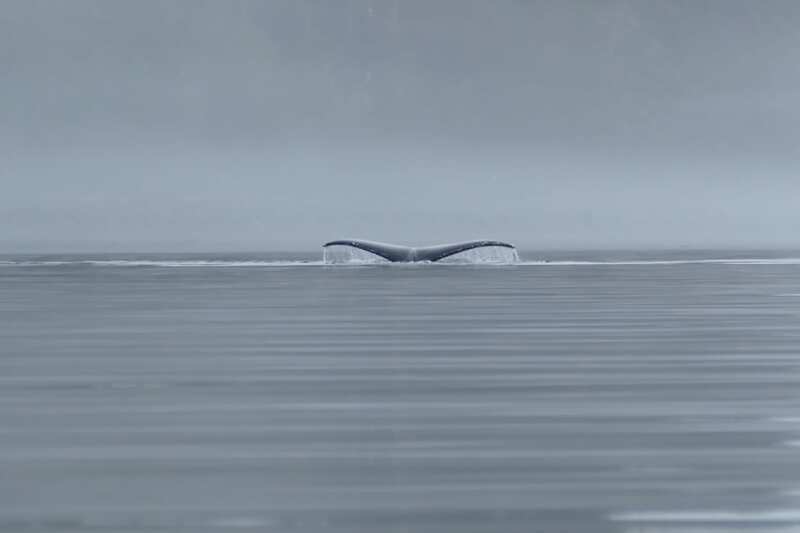 In the last few years, Humpback Whales have also made a strong resurgence in Johnstone Strait and have often been seen on our kayak trips. And if you decided you’d like to sit back and relax at camp, the rambling rocky beach often provides spectacular whale watching right from shore. 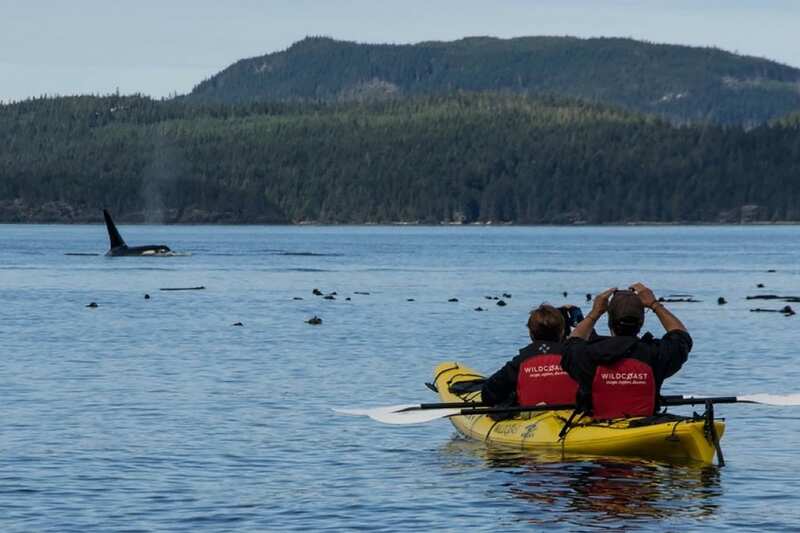 Given their wild nature, you can never be guaranteed to be kayaking with orcas and humpback whales, however your chances to encounter whales in this area is incredibly high. We know an important part of any wilderness adventure is delicious, hearty, and plentiful food. For our kayaking trips we enlisted a local gourmet chef to design the menu and train our guides to be excellent wilderness cooks! Fresh meals prepared each day will leave your belly full and ready for all the adventures the new day brings. Local fare, including salmon and locally grown vegetables, are all part of our coastal cuisine. We only work with the best of the industry. All hotel, boat and tour operators for this Whales & Bears Kayaking Adventure have been carefully selected for their excellent track records and stellar reviews. We provide all gear needed for your trip (life vests, kayaks, paddles, tents, & dry bags) and everything is included in the trip price. Our equipment is kept in top-notch condition. From high quality kayaks and safety equipment to keep you comfortable on the water to full height safari tents (sleeps two) on elevated platforms with real cots (forget sleeping on the ground!) and warm bedding to keep you cozy at night. And if you are a solo traveller you get your own room at the hotel and your own tent at camp, we don’t bunk you with anyone else. Our guides base the kayaking trips each day on the group’s kayaking skills and level of experience. 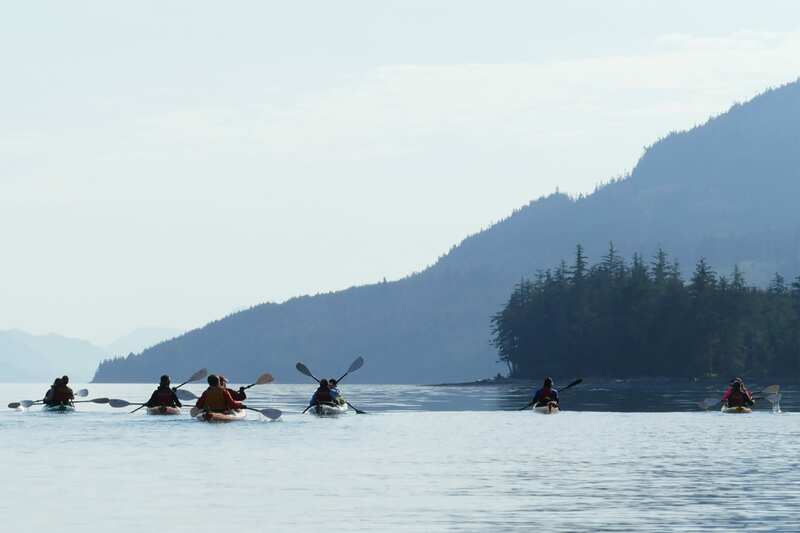 To further enhance your overall sea kayaking experience, guides love to share their wealth of knowledge about Robson Bight and the surrounding area. The maximum number of guests on this trip is 14 and our staff to guest ratio is 1:5 or better.